College of Pharmacy, King Khalid University, Abha, KINGDOM OF SAUDIA ARABIA. Background: Bombax ceiba is a famous plant used extensively in traditional medicine for various diseases. However, data pertaining to its effects at CNS level is limited. Objective: To analyze the anti-anxiety potential of ethanolic extracts of Bombax ceiba leaves on rats using the elevated plus maze protocol. Materials and Methods: Five groups containing six rats each were treated with respective drugs.Control rats were treated with 0.5ml of 10% ethanol i.p. (negative control). Single treatments of diazepam (2mg/kg i.p) were used as a positive control and varied levels of ethanolic extracts of Bombax ceiba leaves (150 mg/kg, 250 mg/kg, 400 mg/kg, i.p.) were applied to other groups. The index of anxiety was measured by observing the entry and time duration in the open arm of the EPM. 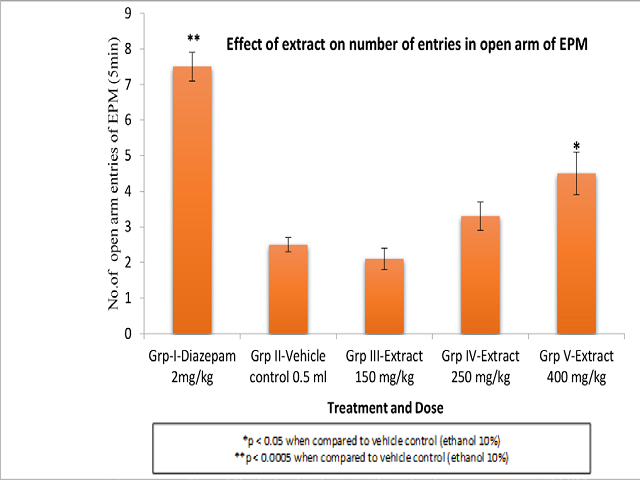 Results: Extract at 400 mg/kg significantly increased the time duration and number of entries into the open arm which was statistically significant (p value <0.05) when compared to the control group (ethanol). Diazepam showed the most significant results when compared to other groups (p<0.0005). Extracts at 150 mg/kg and 250 mg/kg demonstrated negligible results that were statistically insignificant. Conclusion: The results indicate the anti-anxiety potential of Bombax ceiba leaves at higher concentration. Further studies are required to analyze the implicated phytochemicals and the mechanism at cellular level. Effects of Bombax ceiba ethanolic extract on rats in elevated plus maze. ‹ Pharmacological Studies of Oxalis Pes-caprae L.
Alsayari A, Ghazwani M, Almaghaslah D, Alhamhoom Y, Saad M, Ahmed R, et al. Bombax ceiba: A Potential Anti-Anxiety Drug. Pharmacognosy Journal. 2018;10(4):712-714.